For the final day of our week long STEAM festival, we are highlighting math. Sarah at Share It! Science is looking for the golden ratio in the garden. Here at Growing with Science we are going to celebrate STEM Friday by featuring some new math books and related activities. In Solve a Crime (You Do the Math) Alex, an undercover police detective, shows how math can help catch a criminal. For example, on one page the reader is asked to use co-ordinates to map the evidence and then look on a grid to calculate the distance between certain items. These problems will require a pencil and piece of paper to do the work. The graphic-style illustrations are bold and serious, adding to the true-to-life feel. Want to see how it looks? You can check out a sample of some of the pages at Google Books. Math Mavens Mysteries has a Time for Crime math mystery to get students warmed up, complete with audio clips (index to all math mysteries with level of difficulty). Fly a Jet Fighter (You Do the Math) follows pilot Katie as she handles data, interprets tables, and reads dials and scales. The goal is to create a squadron of jet fighter aces and complete the mission. An additional activity to accompany this book might be a making a paper plane (Instructions for nine different models). Launch a Rocket into Space (You Do the Math) follows each stage of the space mission to make sure the rocket blasts clear of the atmosphere and returns safely. It features astronaut Michael who helps the reader compete the math exercises and learn about everything from fractions to timelines. A few problems will require a protractor to measure angles. Each of the books has a glossary and the answers for all the questions are in the back matter. Although recommended for ages 6-8, these books could also be useful for older children who are struggling with math concepts or don't quite see how the math they are learning might be useful. The books in the You Do the Math series would be perfect for homeschoolers and after school math clubs because they can be entirely child-directed reading. Making Room for Math at Science Buddies has instructions for tons of math activities. Don't forget to visit our growing list of math books for children (from counting books to high school level) at Science Books for Kids. Disclosures: The books were provided by Quarto Publishing Group USA for review purposes. Also, I am an affiliate for Amazon. If you click through the linked titles or ads and make a purchase, I will receive a small commission at no extra charge to you. Proceeds will be used to maintain this self-hosted blog. For the third day of our STEAM Festival, we are featuring engineering. At Share it! Science, Sarah is giving information about designing a Rube-Goldberg contraption. Below we are giving some engineering activity ideas. What is engineering and how do you do it? The difference between science, technology, and engineering is not always completely clear, but basically scientists seek understanding by performing experiments, whereas engineers create new products and experiences. If you are doing an experiment, it is probably science. If you are making a model or prototype of something, then the project is probably engineering. Science Buddies has an excellent graphic comparison of the engineering method and the scientific method to help clarify the differences. Recently scientists at Colombia University used the spores of a bacterium to harness the power of evaporation. Basically, they found out that the spores change shape in response to changes in humidity. Doesn't that give you chills? Learn more about at Science Friday. 1. Science Buddies has a huge list of engineering projects, including instructions how to make a "Frightened Grasshopper: Solar-Powered Robot Bug" (kit required). 2. Check out books, such as Cool Engineering Activities for Girls (Girls Science Club) by Heather E. Schwartz and Lana F Flakes (Consultant Editor) has many project ideas, most of which would work for boys as well as girls. This book gives step-by-step instructions for making things like litter grabbers and a table made out of paper. 3. Teachers Try Science lists instructions for how to build your own robot arm. This does not involve electronics, but common household materials. 4. World Space Week (WSW) provides a teacher's activity guide with instructions for quite a few engineering projects. For example, "Houston We May Have an Omelet!" on page 7 involves designing a landing pad to help an "eggnaut" land safely. The WSW educator's page lists links to the activity guides and a number of other resources, or you can download the .pdf at this direct link. 5. The American Society of Civil Engineers (ASCE) has a list of over 100 engineering project ideas from kids educational sites, like ZOOM, plus some of their own, like this extensive project that involves building bridges. Disclosures: The book above was provided by the publisher for review purposes. Also, I am an affiliate for Amazon. If you click through the linked titles or ads and make a purchase, I will receive a small commission at no extra charge to you. Proceeds will be used to maintain this self-hosted blog. Share It! Science and Growing with Science are pleased to announce we are teaming up for a week long Children's Science, Technology, Engineering, Art, and Math (STEAM) Festival. Please join us for information and project ideas to help your family explore STEAM-related activities for the summer and beyond! Today Growing with Science is hosting STEM Friday, the meme that highlights Science, Technology, Engineering and Math books for children (as well as older favorites). The STEM Friday book meme can found each week at the STEM Friday blog. It is a great resource if you are looking for the newest and best in STEM books for kids. You know how much we love hands-on activities here at Growing With Science, which is why we were excited to find Build It: Invent New Structures and Contraptions (Invent It) by Tammy Enz. Author Enz is a civil engineer, and her experience shows in the details in each of the projects. Included are instructions on how to make a device that can open an close a door remotely (with strings), a newspaper fort, a trash grabber, toothpick bridge, a pet waterer and many more. Each project comes with a list of materials and step-by-step instructions with color photographs accompanying each step. In additions to the projects, sidebars are sprinkled throughout that reveal some historically-important inventions. Did you know the can opener was invented 48 years after the invention of the tin can? Amazing! Build It: Invent New Structures and Contraptions would be great for a busy teacher looking for a quick science or engineering project because it has complete and detailed plans. It would also be fun for the home inventor who could build the project as presented and then use the skills he or she learned to tweak the design or come with up with a whole new invention. The book contains plans for a toothpick bridge held together with hot glue. If you want to work with younger children who aren't ready for a hot glue gun, however, try the classic toothpicks and mini-marshmallows. The children can build bridges or towers. Hint: Fresh marshmallows can be mushy. Allow the marshmallows dry out for several days to stabilize the structure before testing or moving it. This quick video shows some of the details. Other materials that can be used for building bridges or towers include plastic drinking straws, craft sticks, and dried spaghetti. 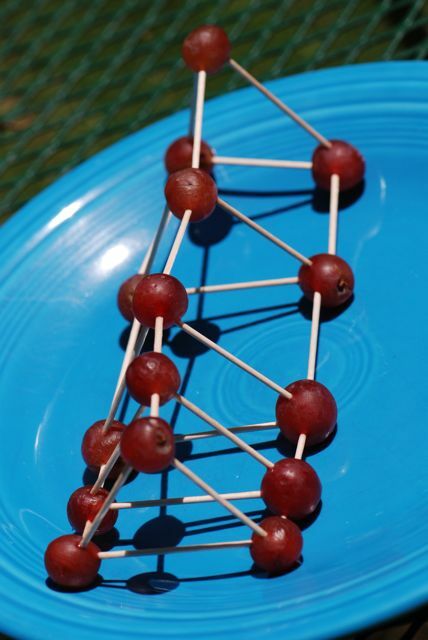 Even grapes can work in a pinch, although the structure won't be a permanent one. These projects are sure to lead to bigger things!